Although it is well known that there were individuals of Jewish heritage and origin living in Florida beginning some time in the 1700's, the first permanent Jewish settler to arrive on the shores of Biscayne Bay did not do so until February 6, 1896. 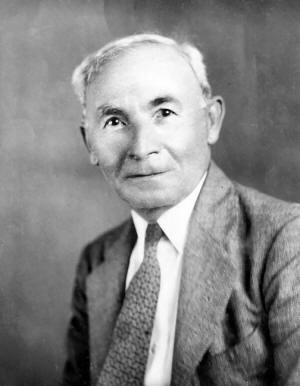 While there is some discussion as to who or whom was actually "first" there is no conflict on, about or with the fact that one Isidor Cohen was the first person of Semitic lineage to remain in Miami on a permanent basis following his tentative arrival. It appears that one Jewish man did arrive before Isidor, but his stay of barely a few months was a momentary transience, and was obviously nothing even approaching permanence. It is possible that Jacob Schneidman arrived "right around" or at approximately the same time as Cohen did, but Schneidman, married to Ida and with baby son Murray, died of cancer in 1903 following which Ida returned to New York. photo: Ida Cohen, wife of Miami's first permanent Jewish settler, Isidor Cohen, gazes proudly at the Miami Jewish Home and Hospital's Founder's Memorial. Mrs. Cohen founded the Home in 1940, the original facility opening in 1945. In 1904, Isidor, ostensibly on a buying trip, went to New York. When he returned, several months later, Ida, now Mrs. Cohen, and Murray, adopted by Isidor and surname changed to Cohen, were in tow. Many, if not most, of Miami's early merchants were Jewish, but Isidor, a signer of the City's charter, founder of the various business associations that would become the Chamber of Commerce, and civic activist, was pre-eminent, being among the founders of Miami's first synagogue, Temple B'nai Zion. That temple, incidentally, was not named for Eretz Yisrael, but, rather, for the man who made the largest contribution to enable the edifice, Morris Zion. Eventually the various persuasions within the religion would separate, the Orthodox forming Miami Orthodox Congregation, the Conservative branch forming Temple Beth David, and the Reform group building Temple Israel. The latter two are still in existence today although not at the locations of their founding. As more Jewish people came to the area, Miami Beach became a highly desirable location and in 1921 the Nemo, the first Jewish-owned hotel, opened on the island city. Then, for several years prior to the 1929 opening of Miami Beach's first Jewish house of worship, Temple Beth Jacob on Washington Avenue, services were held at the Granat family owned David Court Hotel, at 56 Washington Avenue. photo: Isidor Cohen was the father of Greater Miami's Jewish community. Stepping off the boat at the Lemon City dock on February 6, 1896, he was the first permanent Jewish settler to arrive on the shores of Biscayne Bay. His and his family's history is nothing short of illustrious: He was a signer of the city's charter, one of the founders of what would become the Chamber of Commerce and a retail merchant and investor. His wife, Ida, founded the original Miami Jewish Home and Hospital for the Aged and his daughter, Claire Cohen Weintraub was not only a civic activist but was in the University of Miami's first graduating class and founded the Miami Museum of Science. Miami would boast of the first Kosher dining establishment, the Palatial Restaurant, which opened just west of Biscayne Boulevard in the early 1920's, remaining in business until 1945. The area was a magnet for Jewish people coming from the northeast and Midwest, and by 1939 Miami Beach held a majority of the Jewish residents of greater Miami, becoming the nucleus of Jewish life in the region. Although Jews were excluded from no few hotels and clubs through the onerous notices of "restricted clientele," Jewish families, including the Stone, Mufson, Richter, Levinson and others opened hotels at which their co-religionists were warmly welcomed and Miami Beach became the vacation heartland of American Jewry. Spending summer vacations in the Catskills and winters in Miami, innumerable Jewish families, particularly following World War II training in Miami Beach, came to the land of eternal sunshine. With the large number of Jewish people, Jewish owned private schools, particularly the Hebrew Academy on Miami Beach, became essential to promoting and promulgating Jewish education. In one instance, a public high school--Miami Beach High--became, in effect, a public parochial school, with estimates of Jewish student population at the school being over ninety percent. For a number of years, from the late 1940's until the very early 1970's, Miami Beach High School was, with the singular exception of Bronx High School of Science, the number one rated academic public high school in America. 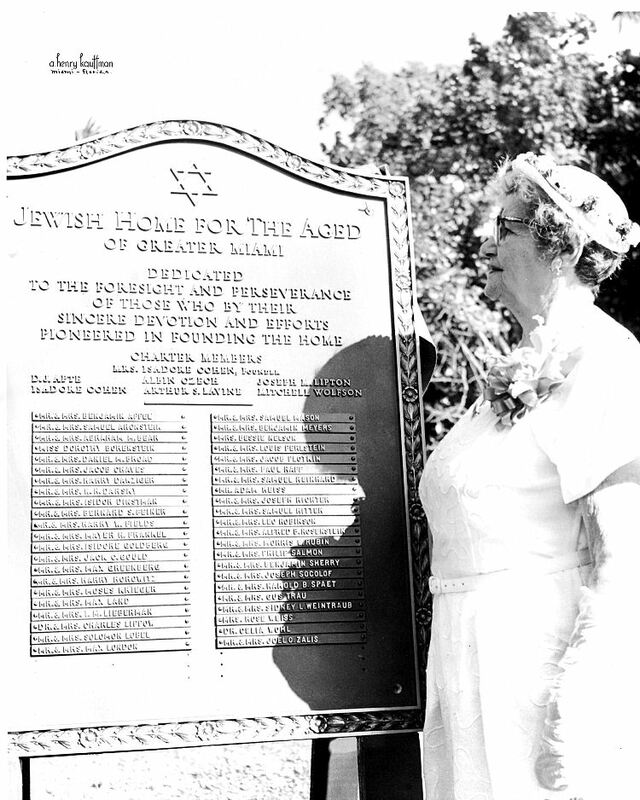 The saga and legacy of Miami's Jewish community is legendary and among the monuments to Judaism and humanity are such facilities as Miami Jewish Home and Hospital at Douglas Gardens (founded by Ida Cohen); the Hebrew Homes for the Aged; Miami Museum of Science (founded by Ida and Isidor's daughter, Claire Cohen Weintraub); the original National Children's Cardiac Hospital (founded in large part by Dr. Louis Lemberg); Normandy Isle and the lower third of the Town of Surfside, built by Rose and Henri Levy; large parts of the City of Aventura; Bay Harbor Islands, built primarily by Shepard Broad, and Mt. Sinai Hospital on Miami Beach. --has been owned by the same Jewish family, the Weiss/Sawitz/Bass family, since it's opening in 1918. Jewish families have owned such fabled eateries as the Famous, the Embers, Joe's Broadway, Harfenist, the Governor, Ambassador, Concord and Hoffman's Cafeterias and the beloved New York style delis, including Wolfie's, Junior's, Pumpernik's and the Rascal House. Unhappily for foodies, all are gone except Joe's Stone Crab, which remains a dynasty and a magnet for great food. Attracting such stellar names in architecture as Henry Hohauser, Igor Polevitzky, Morris Lapidus, Robert Swedroe and Barry Sugerman, Miami's buildings have, in many cases, become classic in America. Jewish owned businesses, from tires, automobiles, neon signs, plumbing, clothing manufacturing and aviation to construction, education and clothing stores have always been in the forefront of Miami's commercial history. Beginning in 1960, with Fidel Castro's takeover of Cuba, a large number of displaced Cuban Jews ("Jubans") made their way to the Miami area, and founded several temples including Miami Beach's Cuban-Hebrew Synagogue. In a number of cases, Cubans have returned to their Jewish roots, their families having fled Spain in the Inquisition and have revitalized several temples locally in the process. Even with the Cuban influx, however, the Jewish population of greater Miami has been in decline since the late 1980's, many people moving to Broward and Palm Beach Counties, south Palm Beach County now having the fastest growing Jewish population in America. Although the population has declined, the Miami-Dade County Jewish population still remains somewhere close to 150,000 people and many areas of the county remain centers of and central to Jewish life in south Florida. Seth H. Bramson is greater Miami's leading and foremost historian. He is Adjunct Professor of History at Barry University and Florida International University and is the author of eighteen books (including L'Chaim! The History of the Jewish Community of Greater Miami) and more than seventy articles on south Florida local and Florida transportation history.